More than 30 years ago, Tau Kappa Epsilon (TKE) Fraternity joined the fight against childhood cancer when Danny Thomas, founder of St. Jude Children's Research Hospital and fraternity member from the Gamma-Nu chapter at the University of Toledo, asked his fraternity to help him with his cause. Chapters across the country raised money for St. Jude during the 1970s and 80s, before the organization partnered with another charity. Before Thomas could make his dream of building St. Jude a reality, he garnered the help of many people from all over the world. Rock 'n' roll legend and fellow Tau Kappa Epsilon member Elvis Presley was one of Danny's early supporters who lent his talents to help raise funds for cancer-stricken children. 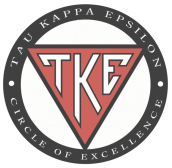 In 2008, TKE renewed its partnership with St. Jude to help save the lives of children with cancer, sickle cell and other life-threatening illnesses. TKE chapters across the country are raising funds and awareness to support the dream of Danny that "no child should die in the dawn of life."